Infectious diseases cause 17 million deaths each year around the world, predominantly in developing countries. For more than 50 years, the Mérieux Foundation has been taking action to help ensure that every child, woman, and man has fairer access to essential healthcare. 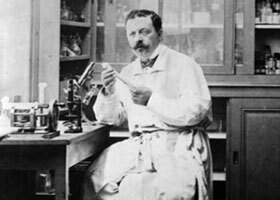 The Mérieux Foundation is a family foundation established in 1967 by Dr. Charles Mérieux, in honor of his father Marcel Mérieux, a student of Louis Pasteur and founder of the Institut Mérieux in 1897. The Mérieux Foundation was awarded official charitable status in France in 1976. Over the years, the Mérieux Foundation’s efforts have focused on bettering global health through a wide range of initiatives, including some of the first symposia on the HIV/AIDS pandemic, the first training center for humanitarian workers, and France’s BSL-4 Jean Mérieux Laboratory for emerging pathogen research. Today, the Mérieux Foundation applies its longstanding expertise in clinical biology towards the creation of a network of laboratories of excellence in infectious disease. The Foundation also supports the renovation of clinical laboratories within communities to give local populations access to improved diagnostics capabilities for better disease prevention, detection and treatment. To enhance scientific expertise in the fight against infectious agents, the Mérieux Foundation enables experts from around the world to work together at its Les Pensières conference center and brings training courses for lab professionals to the field. By bringing together partners with diverse skills and cultural backgrounds, the Mérieux Foundation has succeeded in creating an exceptional international network of scientists, researchers and public health experts active in infectious disease hotspots around the world. In 2012, Mérieux Foundation USA was founded as a 501(c)(3) nonprofit organization in Washington, D.C. By establishing a presence in the nation’s capital, the Mérieux Foundation USA is able to engage American partners in Mérieux Foundation initiatives and open opportunities for new collaborations and technological innovation. The Mérieux Foundation USA also contributes to U.S. government efforts to counter biological threats and foster sustainable health systems around the world.